In addition to the P - 38, there are four gifts, one for each of my friends. I want to say good-bye to them properly. I want to give them each something to remember me by. To let them know I really cared about them and I'm sorry I couldn't be more than I was, that I couldn't stick around, and that what's going to happen today isn't their fault. Today is Leonard Peacock's birthday. It is also the day he hides a gun in his backpack. Because today is the day he will kill his former best friend, and then himself, with his grandfather's P - 38 pistol. But first he must say good bye to the four people who matter most to him: his Humphrey Bogart obsessed next-door neighbor, Walt; his classmate Baback, a violin virtuoso; Lauren, the Christian homeschooler he has a crush on; and Herr Silverman, who teaches the high school's class on the Holocaust. Speaking to each in turn, Leonard slowly reveals his secrets as the hours tick by and the moment of truth approaches. In this riveting book, acclaimed author Matthew Quick unflinchingly examines the impossible choices that must be made, and the light in us all that never goes out. Leonard Peacock is planning a murder suicide. As he packs his bag for school, he has with him a loaded pistol and four wrapped gifts for those he calls friends. It's Leonard's way of saying goodbye, leaving each one with a memento to remember him by. Wrapping them all in pink gift wrap, even his loaded pistol stored in one of his father's old cigar boxes. He plans on shooting Asher Beal. But first, he needs to make it through just one more day, his birthday. If only someone cared enough to see him. Take Leonard's Holocaust teacher, Herr Silverman. Mister Silverman never rolls up his sleeves, is he hiding prison tattoos? A birthmark? Or was he in a state of depression, and his sleeves hide the razor blade scars. Leonard prefers the theory that Mister Silverman may have tried to take his life, because if he was able to redeem himself after feeling so hopeless, perhaps there is hope for Leonard after all. Leonard's mother Linda, she's always despised his signature dirty blonde locks, perhaps she feels they signify the day when Leonard's father fled the country, on the run from the government years ago. Leonard's been growing his hair ever since. But Leonard didn't plan on giving Linda a gift, her false grief would have been far too dramatic. Once she won't be held down with her maternal duties, no doubt her affair with Jean Luc will blossom. But Leonard feels guilty and wraps up the ultimate gift for Linda, his hair, hacking it off at the kitchen sink. Next door neighbour Walt has always been a friend to Leonard. The immobile Walt's lungs are failing, but that didn't stop the duo bonding over old Bogart classics, which was often the highlight in Leonard's week. Leonard would bring his computer over to old Walt's house, purchasing cheap cigarettes over the internet. In a silent prayer, if only Walt would wish Leonard a happy birthday, then he won't go through with killing Asher Beal, or himself. But sadly, Walt just accepts the gift of his Bogart styled hat and before he can be questioned, Leonard goes about his way, storming out in the ultimate Bogart tribute. Sometimes Leonard puts on his only black suit, normally saved for formal occasions such as funerals, carrying an empty briefcase, he pretends to be just another suit, traveling to his dead end job, where he is supposedly perpetually miserable. He always picks a target, the saddest looking traveler he can find, and follows them. Leonard internally begs for one, just one adult, to show that's it's possible to be an adult and still find happiness. That you have choices and don't need to spend your life being pigeonholed. Leonard's path crosses humans from all walks of life. From the woman he followed from the train, screaming obscenities and labeling him a pervert. His English teacher, who was incidentally the first to report his bizarre behavior at school. His Iranian friend Baback, who would practice his violin each lunchtime. Baback was once a victim of Asher Beal's bullying, which resulted in Leonard finding solace in Baback's musical genius each day... Until Baback receives his goodbye gift. But the biggest impact in Leonard's life is made by Herr Silverman. Sometimes it only takes one kindred soul to see when someone in their life is troubled. But can he save Leonard in time? 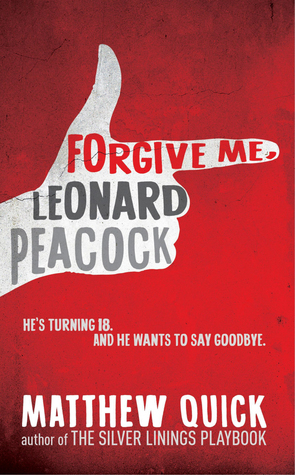 Forgive Me, Leonard Peacock is disturbing, real and raw. It's the story of a young man who feels he has nothing to live for, and plans on taking out a fellow student in the process. He has acquaintances in his life, but sadly no one realises how troubled Leonard is, apart from teacher Herr Silverman. At first glance, it feels as though it could be seen as a book to bring to light the lack of gun control and access of weapons to our children, but it isn't. It's a psychological viewpoint from a suicidal young man and how he's been let down by the people in his life. Leonard may be a lot of things, but crazy isn't one of them, and the further the reader reaches, the more his sanity will come to light. This isn't for the faint of heart, it'll take hold and throw you into Leonard's world of sadness, frustration and depression. Your comfort zone will be blown to pieces. Make no doubt, Forgive Me Leonard Peacock is confronting and will leave you with a heavy heart. Only for more mature adult readers, in no way would I allow a young teen to read this. The social message is important, but how it comes together is far too confronting and mature for most teens.